Well, after a few days of solid working and very little sleep for both of us, we have reached a point with the house that we are happy with. Not everything is finished, but the place still looks lovely compared with before. Now all we have to do is prepare for a good party. The weather forecasts are encouraging thank goodness. All we have to do is get the gazebo up, buy in the beer and wait for the hog to roast. Bring it on! The weather is going to be crap. What a bummer. Things really aren't looking good at all for the deadline of Dom's birthday party. Every evening last week was dominated for both of us with preparing a presentation for the MD for Friday. Yesterday it was hard to get motivated. We went shopping for tiles, a gazebo, plants etc and when we got back Dom started putting the skirting board on, but this also turned out to be a slow job, so there's only a couple of bits on there now and I can't really start painting until that's done. Today, we were sitting having a cup of tea with breakfast when I heard what I thought was a dripping noise coming from near the front door. Turns out that the pipes that feed the bath taps (not Dom's workmanship) have leaked through the ceiling, so it had to be fixed. Dom is working on that now. The handles for the kitchen arrived yesterday - they're lush. I got home early from work today and cleaned the window frame and sill ready for painting. 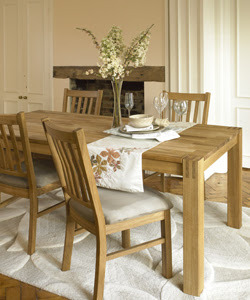 Then we went to Bluewater and bought this dining table and chairs. It will be available for pick up the day before the party! Aaagh! We worked our arses off at the weekend and the floor is down. It looks fantastic, it really feels like a big achievement. There are still so many things we have to do before Dom's party though and twelve days doesn't sound like much at all. I can't remember what we did Thursday night, but Friday, we really got on with stuff. We went to B&Q and bought the skirting boards and some router bits, then I forced myself to sand all the door frames that needed sanding as it was important to get this out the way before we could start laying the floor. Dom cut the corner sections for the bespoke corner doors we are making and with his new router bits they came out very neat. Nothing much got done Tuesday night. I sanded the window sill and Dom fell asleep on the sofa. He had a 4am start yesterday to go to Edinburgh so the only thing we did last night was enjoy a bottle of red wine. It was good to have a break. We're going to try and complete some small tasks tonight but really, the only time we are finding we are able to make any real progress is at the weekend. Nearly there! Not much was done last night. We were both feeling weary and a bit de-motivated from the pressure of the jobs. 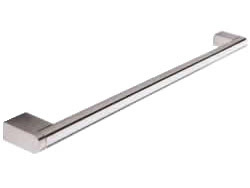 I did order these handles for the kitchen doors though. Most of the kitchen doors went on yesterday and I finished taking up all the gripper-rods and skirting boards ready for the floor. We still made time to go and watch the Le Tour de France which came through our village. It was excellent! Yesterday morning we went out early to shop. It was supposed to be a quick trip, but it was 7 hours later when we returned! We went to Gurney & White first and bought a new Roca sink for the downstairs toilet. We looked at some Roca toilet pans and a sink for the bathroom too but I'm going to compare prices on the net before we buy. Then we went to three tile shops to get ideas for the kitchen and bathroom, then to B&Q to buy the underlay for the floor and finally to Bathstore to check out more bathroom ideas. When we got back I took up the carpet. I wasn't expecting it to be so difficult, but there is A LOT of carpet and it's heavy. I had to move the furniture around to be able to access it and then cut it down into about four sections to be able to roll and remove. Then I used the crow bar to lever up all the gripper-rods round the edges of the room. Dom got all the top kitchen units in, but the top corner unit was a real struggle and had to be shaved down to fit. It's really coming on! What better to be doing on a Friday night than hanging wall units?! Hmmm. Longing for the days when we can leave the house. Last night Dom moved the electrics for the oven, as typically, there is a box at the back of the oven that is in just the wrong place and prevents the oven from going back against the wall as far as it needs to. I tried to remove the skirting in the entrance way that I have been working on, but it is really difficult to prise off without damaging the freshly plastered walls. Luckily, most of it is off already. We really have to push forward this weekend. I'm going to take the rest of the carpet up and crack on with door frame sanding tonight. There were more setbacks yesterday. The oven is having to be set slightly lower than the other units to accommodate the hob. It won't be noticable - it won't be as low as in this picture, but it does require some accurate carpentry. So all that was done yesterday was making the filler sections for either side of the oven and resetting the corner unit to remove a bracket that was obstructing the dishwasher. At least everything was in place for the granite templater to measure up. He spent 2.5 hours with Dom and was impressed with the accuracy of his work, asking if he did it for a living! Dom is back at work now, so there won't be much happening until the weekend. We had scheduled to lay the floor this weekend, so I might have to do that myself. Bring it on! Dom had a bit of a set back yesterday. The oven that we bought doesn't fit in the oven housing unit. It's not a problem design-wise because we already have to build custom filler panels either side of the oven, it just means that Dom needs to build a custom unit to house it. For this he needed some white board to match what the units are made of and sourcing this took a big chunk out of his day. Everything else is fitting to the millimetre. The freezer door has been hung and the drawer fronts are on. Dom also built a custom filler for behind the curved unit, which is looking good now that it has it's door. It is such a slow process though - but perfection takes time. I continued to sand door frames when I got in from work last night. I really hate that job. Only one more door frame to go, then three doors and the window sill, then I can paint. When I got home from work yesterday Dom had carefully raised all the base units to the right level, and had them bolted them to each other and to the wall. The huge end panel had also been attached to the fridge freezer unit. It's looking good. It feels bigger than before, but granted we don't have the wall units up, nor the black worktops on, which will darken it a bit. Over the weekend Dom made good progress on the kitchen. He boarded up the pipework he'd done for the dishwasher and when there was a break in the rain he was able to get outside and cut down the end panel that goes down the side of the fridge freezer. We also used a water level and Dom's new laser level to measure and mark the right height for the units so they will accommodate the granite for the worktop and the windowsill. I painted, filled and sanded the entrance way. Then took the doors off and started sanding the door frames. It's a tedious job.